Guest ales | Boy Mestizo: Hoy, London! Everyone enjoys a cheeky pint or a flirty glass of wine after work, no? You know how it is: you get a group of you from work, you head down to your usual post-work watering hole (“the meeting room downstairs”, as my current company calls it), and you all have a natter and a couple of drinks and then head on your merry ways – unless, of course, it’s a Wednesday, Thursday or Friday night, or any other night of the working week, and things escalate and get messy, and you end up partying hard. Andrew WK HARD. Thing is, that pub or wine bar you always head to every time someone proposes a drink? Unless you happen to work somewhere really cool and trendy, you would probably never, ever frequent your local watering hole in any other circumstances, because either a) it’s crap b) it’s where your colleagues/directors hang out c) it’s always crowded or d) it’s bloody pricey. No matter how much you avoid it otherwise, inevitably, you always find yourself there, putting up with it until that time when it’s safe to resume your life elsewhere. BUT: what if you had a choice? What if you were able to propose another location, just to “mix things up a bit”, to “bring something new to the table”, to find somewhere else just that bit less odious etc. etc.? Well, this new series of reviews is just for you. It does not profess to be comprehensive – it is purely based on where I’ve had the chance to go to for my after-work drinks during my potted career around London. It does not profess to offer magical places of alcoholic delight – some locations are just lacking in good choices, but we just have to shut up and put up with what we have. So, first off, we’re going to that God-forsaken No Man’s Land: south of the river (I jest, but only because I’m a south Londoner now). More specifically, I’m talking about that stretch between London Bridge and Tower Bridge, including the More London development. This Nicholson’s pub has quite a few great things going for it: riverside location with a sizeable terrace, a rather large and characterful interior, an excellent and ever-changing range of guest ales and, previously, not bad prices. It’s great for sipping a pint of ale by the river, watching the sun set over the City, and having a natter with friends. The food’s pretty decent too, if you’re looking for something British and hearty. Unfortunately, all of these positives do mean that the place can get horrifically busy in the immediate post-work crush. As in, elbows-out-sorry-don’t-mind-me-as-I-slip-and-slide-my-way-across-your-chest/back-and-inadvertently-fondle-you-with-my-beverage busy. Service does tend to be brisk at the bar though, seeing as they’re mainly pouring pints or glasses of wine, meaning you never have to wait too long. On the flipside, the crowd does mean that it can be quite a lively place, good enough for getting you buzzing again after a hard day at the office. This is especially true in summer, when the crowds can comfortably spill out to the riverside and enjoy the fresh air. I do miss being able to go to this pub more frequently. I am just about due a free pint from their discontinued loyalty card scheme – maybe I should see if I can go claim it. VERDICT – A good place. Decent pub in a great setting. 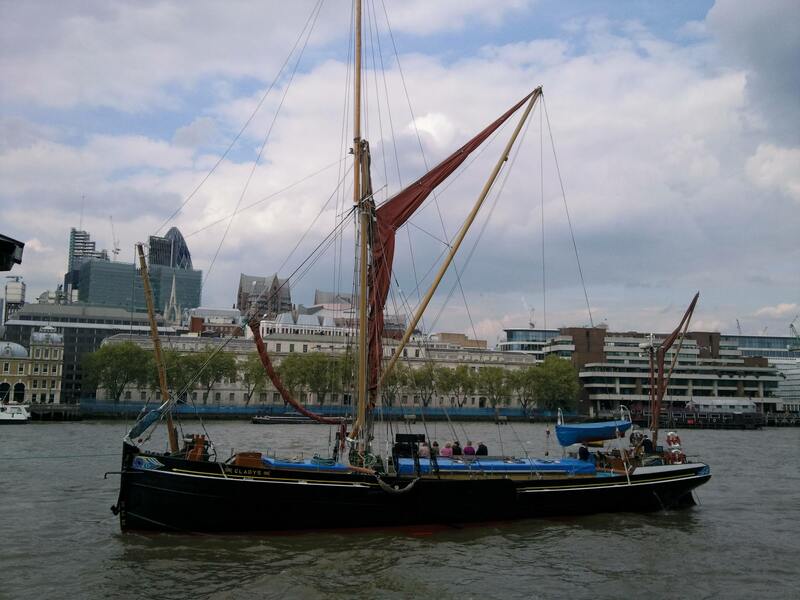 Sort yourself out with a pint of one of their guest ales, grab a table outside and enjoy the view over the Thames. Just bear in mind that everyone else is probably thinking the same thing. A mudlark is someone who goes scavenging in river mud for any items of value – which, if you strike lucky, can be quite lucrative sometimes – but you certainly won’t find any in this pub, especially not of the traditional type. It’d be a bit smelly if you did get them coming in, so it’s no big loss. What you get instead is another Nicholson’s pub with lots of character (imparted by heavy wooden beams and pillars supporting a white-washed brick ceiling) and a decent range of guest ales. Nicholson’s seem to do pretty well on guest ales and on ensuring their pubs look like they have lots of tradition and history behind them which, as far as pubs go, is quite a good thing. You expect a pub to have some history and character, otherwise what’s the point? 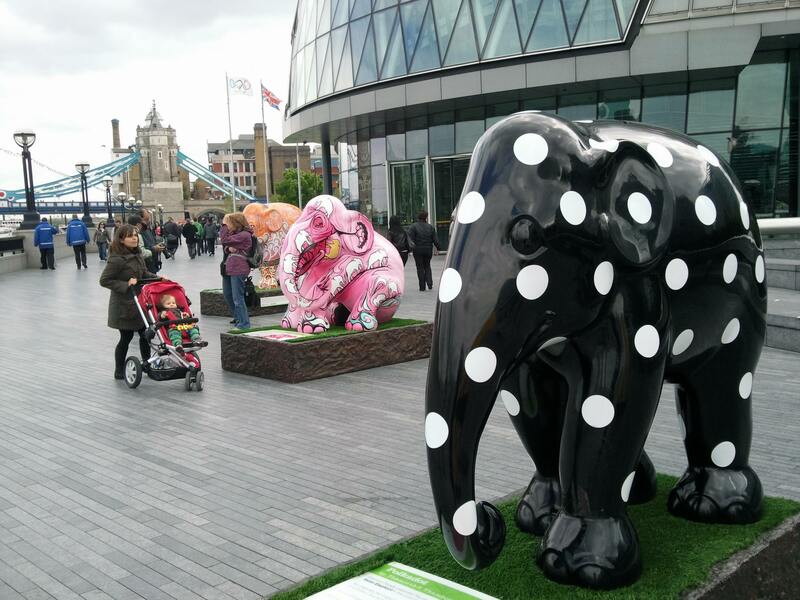 Especially in an area as historic as Southwark, you want something that’s reflective of the surroundings. But enough on that. What’s it like to drink at the Mudlark? I’ve always managed to find space to sit down, no matter how busy it got – either in the rather cosy interior or in the equally cosy courtyard outside. Cosy it may have been, but it’s not cheek-by-jowl cosy, so you can still have those intimate conversations. However, it can get a bit loud inside, but not deafeningly so, allowing for you to sit/stand around with colleagues in awkward silence not because you can’t hear them but because you don’t have anything in common with them. So what I quite enjoyed doing with friends was coming here, having a pint and then following it up with a pie. 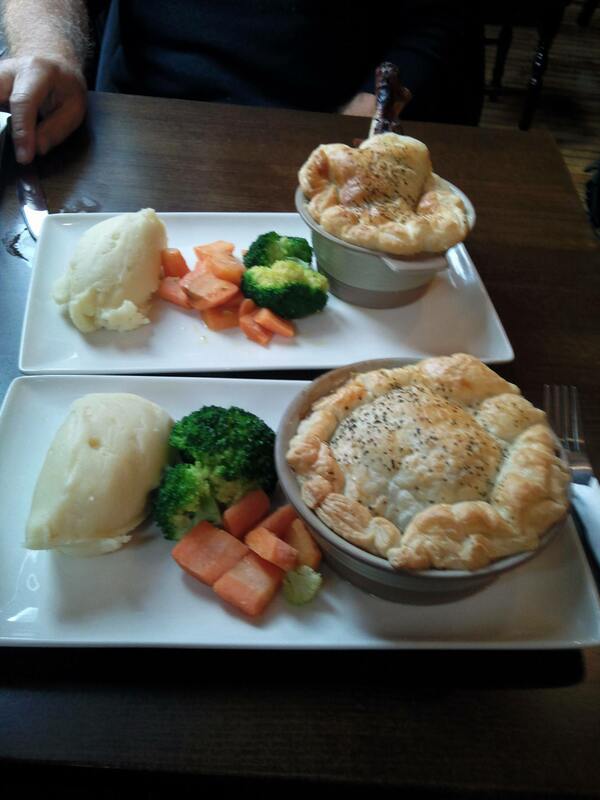 The pies at the Mudlark are pretty decent and substantial for what they are, and will give you that wonderful warming feeling that is vital for survival in these cold winter months. I still pop here if I am meeting with a friend in the London Bridge area – as it’s just around the corner from the station, it’s a perfect meeting spot before heading on home to New Cross. VERDICT – A good place. Another characterful pub set in decent environs, with a good selection of ales and food that does satisfy. Despite its small size, there always seems to be enough space to squeeze a group in, which just adds to the busy and buzzing atmosphere. And as a stopping point before the rest of the evening, it’s perfect – down your pint, and away you go through London Bridge station. Now this is a pub I did not frequent as often as the Horniman or the Mudlark, even though it was closer to the office. According to their website, the pub was built in 1884 and still maintains its original tiled murals (ahh see, there we go – the history). Another feature which they’re quite proud of, and which does distinguish it from other bars and pubs in the area, is the high-ceilinged, cavernous space inside, within which the island bar in the middle seems rather dwarfed. It makes it feel rather roomier than it actually is – the place does get busy, presumably from the More London crowd situated just across the road. The only times I’ve been have been during summer, so standing outside on the pavement in the sunshine has been pretty alright and certainly much more preferable to staying indoors. 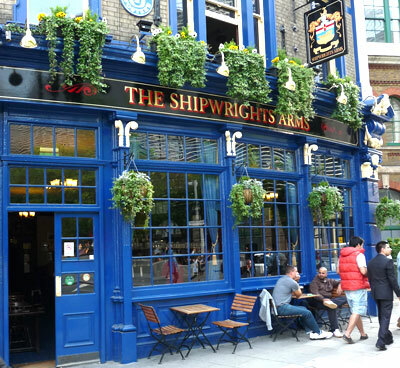 So what is it about the Shipwrights Arms that meant I did not go there that frequently? There was no real particular reason, but perhaps there was a first impression that was formed in a very superficial fashion: the clientele there seems to be very male-dominated. Speaking as someone who has worked in the City and now Canary Wharf, to criticise a place for being male-dominated now sounds a bit rich of me… but I guess I like places that seem to offer a wide appeal, not that there’s anything particularly about The Shipwrights Arms itself that necessarily disadvantages itself in that manner any more than the other places. And certainly, the crowd doesn’t seem intimidating whatsoever. It’s just a, you know, standard pub. Ah well. If you do find yourself at The Shipwrights Arms, you’re not doing too badly. There are far, far worse places to find yourself for a cheeky pint after work. VERDICT – An okay experience. It’s a standard pub that has some distinctive features. It never struck me as being the most attractive and appealing place to go to, but that hasn’t stopped me from popping in there every now and then. And that’s probably what it’s good for – an occasional change from the usual watering hole. Certainly doesn’t do any harm.